I’m a die hard Padres fan, but I have to say Jake Peavy has not shown the ability to handle the big games. I think he was saying (correctly) that he needed Piazza to save him because he could not get the job done himself. It would have been great if Mike had made that play, but when he didn’t Jake should not have put that slider over the plate to Pujols! Even Bochy was quoted before the game as saying that it was important that the Padres not let Pujols beat them. I guess Jake wasn’t listening. As anyone could see who has ever put a pair of spikes on, that after that batting practice slider Peavy grooved to Pujols he was visably rattled that homer really got to his head. Yet no visit from the bench or an all star catcher for an incouraging word or to settle down a shaken pitcher. I fault Bochy and Piazza both for Peavy just falling apart. Bochy for letting the one guy who can put a game out of reach at any given at bat and not calming him down, and Piazza for not coming out to talk to the guy. I don’t blame Piazza for the missed foul ball because one defensive play did not lose the game. It was a lack of offense and a lack of coaching. As a north county native even though I haven’t lived there in quite awhile I have been a loyal Padre fan since the begining and will always be. I remember and suffered through the bad years I mean the really bad years so it is good to see team in the playoffs. Just with a little more offense and a little more coaching. 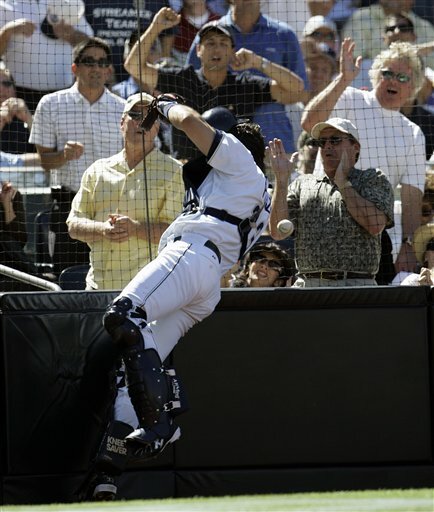 Whether or not the ball clipped the net, the vast majority of major league catchers track that ball off the bat rather than struggle to find it as Piazza did… then they keep their feet and keep track of the fence as they approach it rather than stumble into it and fall over as the ball falls to the ground. It’s not the miss that is so ridiculous — I think it did hit the net — its the inability of an all-star “catcher” to get himself in a position to make the play. Secondly, I have yet to see any commentary on the two strikes — one two inches off the plate outside, the next four — that struck out Pujols in the first inning or how radically the strike zone changed after Pujols’ justified complaint after the first pitch in the fourth inning was two inches inside. There’s no conspiracy, I don’t believe MLB or the umpires are corrupt, but Carpenter was not getting the same plate width as Peavey until the fourth when each side seemed to get the same strike zone… but by then, as bmboomer points out, Peavey had lost it, his teamates hadn’t helped him out or picked him up and the game had tilted seriously in the Cardinals direction. Lastly, does anyone else think that Chris Berman is a horrible baseball announcer. The director and camera men were showing shots of Pujols’ frustration after his first inning at bat and, later, LaRussa barking at the umpire and Berman just stayed in his own world talking, and talking, and talking and talking… He loves football, doesn’t keep up with baseball, only does Yankee games until the play-offs and won’t let the game come to him as so many of ESPN’s other, excellent baseball announcers do.